A few days into 2014 I decided that I was going to start #365daysofpraise… A post a day of something I’m thankful for. 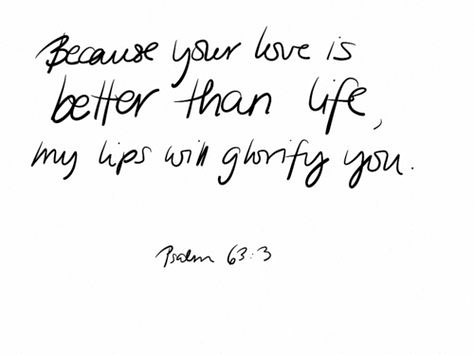 I love Psalm 63:3 – Because Your love is better than life my lips will glorify You. It’s from a moment in my life where a lot of things changed for me in the best kind of way. It reminds me to always keep when comes out of my mouth honest, pure, kind, full of faith, hope and love. Naturally, I can be quite a sarcastic person, I’m happy to admit that. It’s part of my character, but what isn’t part of my character is unkindness and probably more times than I’d like to admit, that is what my sarcasm came across as. Over the last four and a half years I’ve found myself on this adventure of watching what comes out of my mouth. God has designed me to sing and worship and change atmospheres over people and their situations through that and I’ve been learning that what I say outside of those moments matters just as much as what’s sung within them. Watch the way you talk. Let nothing foul or dirty come out of your mouth. Say only what helps, each word a gift. Don’t grieve God. Don’t break his heart. His Holy Spirit, moving and breathing in you, is the most intimate part of your life, making you fit for himself. Don’t take such a gift for granted. Make a clean break with all cutting, backbiting, profane talk. Be gentle with one another, sensitive. Forgive one another as quickly and thoroughly as God in Christ forgave you. I was blown away that I could grieve God and break His heart by what I say. That alone makes me want to always be praising others, cheering them on, and speaking well of myself (that’s a biggie). I really want praise, honour and kindness to be the first response to whatever comes my way in life. I want helpful and compassionate and honouring words to be what flows out of me so I decided I was going to make an investment into that. I’m constantly left astounded by how God uses everything I face to build up within me greater character. By no means do I think that I have the ideal character, I fall short often, but because I know who I belong to I can recognise all the times and different ways God speaks to me and corrects me. This simple, yet large idea of being thankful intentionally for something every single day for 365 days on Instagram is something that I believe has altered the way I go (and will go) through life. I know that life won’t always be rainbows and sunshine. I know that death happens, sickness happens, sadness happens, but I also know that God is far bigger than any of that and that fact alone deserves absolutely every ounce of my praise. I want thankfulness to be a natural response. I want it to be the first response; the knee-jerk reaction. The thing I do without even realising, yet with intention. I’d challenge you to spend some time investing into praise, honour and kindness. How you do it may look different to how I did, but I can guarantee that you won’t ever loose out on anything by spending time being thankful. To wrap this up, here’s what I wrote on my 365th post, it sums it all up perfectly for me.